Applications are in for our three choice schools. It was super easy. Everyone should do it. 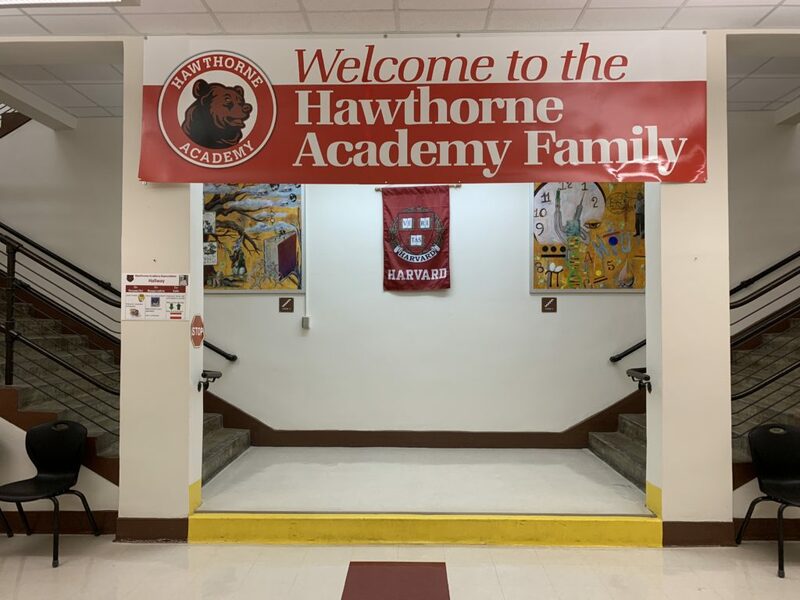 While we applied, we were automatically registered for our neighborhood school, Hawthorne Academy. It’s a valid option. It’s the kind of school where our kids would be fine. We’d be fine. Everyone at Hawthorne is giving it their all, from what I hear. They just have a vision problem. Unrealized potential is really frustrating. And where there’s frustration, there’s fighting. It’s one thing when the fight comes to you, it’s another thing to choose to go to the fight. With your kids in tow. When I first started writing about education in 2013, Hawthorne was a school that folks were watching. Located along the San Antonio River, adjacent to the hottest real estate in San Antonio (the Pearl), it was one of those schools poised to naturally grow its enrollment as a formerly semi-industrial neighborhood filled with people. It was one of SAISD’s first in-district charters, focused on Core Knowledge, fine arts, and leadership. Librarian Bonnye Cavazos was the spark that brought in partnerships with neighborhoods, academics, museums, and more. Ironically, in the same article wherein I profiled Hawthorne, I wrote about Lamar Elementary, which was similarly located in gentrifying Mahncke Park, with lots of museum partnerships, community involvement, etc. I say “ironically” because the two seem to have switched places, six years later. At the time, Lamar was fighting low enrollment. The middle class parents moving into the neighborhood eyed it somewhat suspiciously, though a healthy handful were investing time and energy into getting more resources, forging partnerships, etc. Under the leadership of Brian Sparks, Lamar is quickly becoming one of the more beloved success stories of SAISD. Parent engagement is up with a strong effort to reach all socioeconomic groups, enrollment is up, partnerships are thriving, and the school’s identity is strong. It has ridden the wave of investment in the cultural institutions with whom it partners. Not that Lamar is without its challenges, but I’m not going to get into those here. Hawthorne, with the same leadership it had in 2013, seems to be stuck. Enrollment is declining. Parents are frustrated. The Core Knowledge curriculum seems to have faded away, while the rest of the charter is in jeopardy as it comes up for renewal this spring. The “leadership” component, it has been suggested, could come from “Leader in Me” curriculum, the same basic Stephen Covey product used all over other school districts and the Alamo Colleges. It’s exactly the kind of pre-packaged, mass market stuff that in-district charters are supposed to be avoiding. Some parents at Hawthorne have put forth another idea. They would like to see Hawthorne embrace its place along the San Antonio River more fully, and to partner with civic institutions like San Antonio River Authority (SARA), The Tobin Center, The Culinary Institute of America, The Missions, the University of the Incarnate Word, and others to create a place-based curriculum. As a River School, students could feel connected to the city and see real life applications of what they learn in school. They could see science in action at SARA and the CIA, arts at the Tobin Center, history at the Missions. And they could connect to all of it via the same familiar route: the river. That idea comes straight from parents whose children are and have been enrolled at Hawthorne for a while. They have been digitally walking around with a Word document asking people to read it. Now, a few things I’ve learned about parent-led initiatives: Many are enrichment-focused, with little impact on academic subjects. Many are also niche interest projects that will live and die with the parents who champion them. Also, most, like the River School idea, are spearheaded by white, professional class parents. When that happens you have to look at who the idea actually benefits, and who actually wants to see it happen. However, the River School idea may actually be different, because it’s built off of the existing charter, and has a wall-to-wall vision for the whole school. Not an after-school club, school within a school, or an elective. It would be a marshaling of resources for every child in the school, and bring many low-income kids into contact with powerful institutions, giving them a sense of ownership and belonging in their city. From an equity standpoint, I like the River School idea. SAISD has two in-house resources that could further develop this initial idea if parents and teachers wanted to do so. First, they have access to the funding they would need to realize the more ambitious parts of the plan. Senate Bill 1882 would allow a partnership with any of those nonprofit entities (or an umbrella nonprofit formed by the City of San Antonio), to bring in extra per student funding. Unless something changes drastically in the Legislature this year, that will likely be around $1,400 per student more, which could fund supplemental activities and supplies and personnel needed to facilitate all the off-campus learning and on-campus professional development, hosting of partner organizations, etc. Next, they can look to a similar model in Dallas ISD. While City Lab High School opened after Mohammed Choudhury left Dallas to become SAISD’s chief innovation officer, he was part of the design process. He knows what needs to happen to make sure students were academically on track while using the city as their classroom. Of course, mention Choudhury’s name (or any member of Superintendent Pedro Martinez’s cabinet), and conspiracy theories start flying. Something about wanting to turn all SAISD schools into charter schools (because of Democracy Prep at Stewart), or funnel resources to the middle class (because of Diverse by Design schools)…I honestly can’t tell if the theories are misunderstandings, misinformation, or just a bad game of telephone. But I’m not here to defend or skewer the guy. He knows how to design a school like this, it’s a design parents seem to want, and a design that’s having success somewhere comparable. CAST Tech does similar stuff, ALA does similar stuff. Hawthorne could take that “stuff” and make it something really distinctive and empowering for the kids, and I just hope that it wouldn’t be tripped up by people’s suspicions about how a bureaucrat feels about charter schools—which has nothing to do with the parents’ River School proposal. That would be a shame. Hopefully, they won’t. The school has been given an extension on its charter revision, and hopefully they will use that time to summon their creative juices and come up with something that inspires the teachers, students, and parents. Hawthorne could very easily recapture its moxie. They’ve got all the ingredients, they just need the right recipe.